Wesley R. Williams is being held in the Ada County Jail on felony counts of burglary, malicious injury to property, and grand theft in connection with a violent crime spree in Eagle early Tuesday morning. Eagle Police had to use a Taser to take the tree branch-wielding Williams into custody. Investigators are still trying to figure out why Williams broke into the homes of people he didn’t know and then tried to attack officers. Eagle Police began their investigation shortly after 2 a.m. Tuesday when dispatchers got a call reporting that a man broke into a home in the 600 block of N. Parkinson Street. When police were on their way to the home, a neighbor called dispatch and said a man matching the same description was trying to break in to their home. When officers arrived, they found a man, later identified as Williams, holding an 8-foot-long large tree branch to bang on the door of a third home. 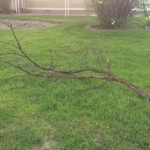 An Eagle Police officer then told Williams to stop what he was doing and drop the branch. Williams began yelling and walked towards the officer, who warned him several times to stop. The officer used his Taser to stop Williams as he was raising the branch over his head. Once officers had Williams in custody, they were able to put together what happened. Williams first broke into a home in the 600 block of Parkinson and woke up the person who lived there. That person grabbed their handgun and yelled at Williams to leave. Williams left that house, ran across the street, kicked in the front door of a home, took some keys from inside, and stole a Jeep. He then went back to the first house, where he tried to get back inside again but the homeowner once again told him to leave. 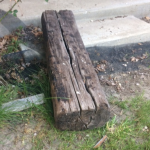 Williams walked around the home, picked up a railroad tie from the yard, and threw it through a window. 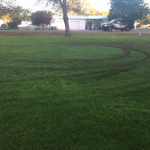 Williams then ran over to the stolen Jeep, got in, and drove to the different house nearby, where he did several donuts in the yard, tearing up the grass, before getting out, grabbing a branch, and trying to get inside that house. That is when Eagle Police arrived. They were able to take him into custody after using the Taser. Williams continued yell and act erratically after he was restrained. He had to be strapped to a gurney before being taken to a local hospital for a medical exam. Williams was medically cleared and booked into the Ada County Jail just after 5 a.m. He is also charged with a misdemeanor count of resisting arrest. Police are still not sure how Williams got to the neighborhood and where he was before that. He does not appear to have any connection to anyone who lives in the three different homes.